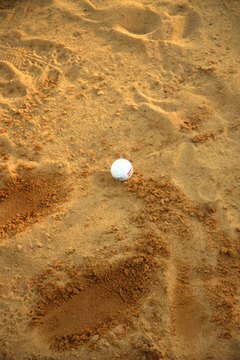 Dirt and sand on the ball can alter its flight path. Both new and used golf balls easily gather dirt, sand and grass while out on the course, warranting a thorough cleaning post-game. Golf balls are carefully weighted and designed for proper aerodynamics. A club connecting with a dirty ball can result in poor impact or backspin, negatively affecting distance, speed and shot accuracy. Choose a golf ball cleaning agent. Many home solutions are convenient solvents. Cleaning options include undiluted beach or ammonia. However, do not mix these chemicals together for safety purposes. For the quickest and cheapest option, a soap and water mixture may work. Add cleaning solvent to a bucket of warm water. Buckets allow for multiple balls to be cleaned at the same time (versus professional machines that clean a single golf ball during a cycle). Add dirty golf balls into the bucket. Allow the balls to soak for ten to twenty minutes. Scrub tough jobs. Golf balls that have slimy mold, caked sand or dried grass clippings may require individual cleaning attention. Consider the use of a basic household sponge or an old toothbrush to scrub each ball. For permanent ink markings on a golf ball, use a cotton ball soaked in nail polish remover. Utilize the dishwasher. Some golfers experience ball-cleaning success by tossing dirty golf balls in the top rack of the home dishwasher. Machinery and balls should not be damaged in the process. However, dishes should not be cleaned concurrently. Examine cleanliness of golf balls. Golf balls should have dirt-free dimples and no access weight (such as sand) to complement shot accuracy. Additionally, a golf ball should shine brilliantly white to assist with visibility during play. Polish the golf balls. Balls can dry in the sun or be shined off with a towel. The result will be clean, white golf balls that are aesthetically pleasing and fully-functional for the next round. How Do I Clean Golf Balls From a Pond?